Not all stories end well at Overnight Pc Repair. 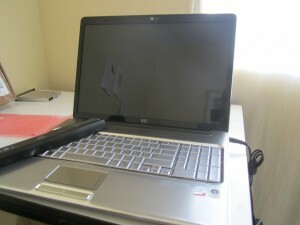 And this case of hp dv7t-1000 laptop is a perfect example that needs to be addressed. The model of this laptop was dv7t-1000, 2gb of ram, 320gb hdd, windows vista, core duo processor intel. Customer called us first week of august and asked if we replace dc jacks on the laptops. we said yes, asked her for the model of laptop, gave her quote over the phone. She said she would consult with her husband and call back. She called yesterday. Everything was great we ordered power jack and waited for it to be shipped in. Few days later dc jack came in, customer brought in the laptop. we took it apart, went ahead to install the part, but the part didn’t fit 🙁 Because we didn’t get the correct model number. Customer told us over the phone its a hp dv7, but she didn’t mention a little letter “T” after dv7 and that made big difference. 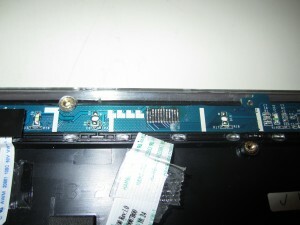 few moments later we discovered that another piece was damaged and that was a power button panel ribbon cable. The way hp team has designed and built it, it was very easy to break and was basically holding on a piece of tape. At least thats how it was on the new piece that we ordered. it took another 3 days to receive it. Now its here and it is on. but the laptop is still not working. When we spoke to the customer, she mentioned the reason dc jack broke in first place is because it was dropped and it landed on the power cord which was plugged in to the laptop. we suspect the reason it doesn’t power on, because the motherboard was damaged during impact. In fact its very easy to do.